Back in March 2013, Frankham resident Brigitte was alerting neighbours to the fact that letters, bank and credit card statements, cheque books, magazines on subscription were either not delivered at all or posted through the wrong letterboxes. She suggested residents visited Creek Road Sorting Office to ask them to monitor their mail, and encouraged people to make a formal complaint. This was around the time the Royal Mail was streamlining (cutting) staff and services in readiness for the big privatisation sell-off. A Crossfields resident working temporary shifts over Christmas found himself in a shambolic organisation paying under the minimum wage. Though it's been sold in the meantime (at a loss to the taxpayer) since Brigitte complained over a year ago, things have not improved. Mail arrives as late as 3pm (an extreme exception was this morning when our post turned up at 10.30am!) and post is still 'going missing'. Ruth in Cremer House contacted us yesterday to say her Council Tax bill, Service Charge bill, her P60, her pension forecast and hospital appointment letters have all 'not arrived' in recent weeks. She knows at least two others in her block who have also not received important mail. She says that in order to complain, you have to know what date the items were posted – the problem being that you often don't realise what it is you haven't received! For instance, you may not remember whether you set up paperless billing when you signed up online for a particular service, but then you'll be getting regular email notifications, right? Or are you one of those people who let the mail (especially bills and anything from Lewisham Homes or the council) pile up on the coffee table till you've got time to deal with it? This maybe a reality check. We were just going to post up Ruth's story as a matter of public information. But this morning we got a rather officious 'Default Sum Notice' from our credit card company saying we had missed our last payment. Unfortunately, we hadn't noticed not getting the bill – it's been a busy month – but we usually get it and make a note in the diary to pay it a week before it's due (why pay immediately you get the bill, they give you two weeks, ffs). To be sure, we looked everywhere for that bill and couldn't find it. Not paying it has resulted in charges of over £16 and the stopping of the card (and possibly a black mark on our credit rating). Needless to say, the card company would not take responsibility for us not receiving the bill, and made us set up a direct debit. If you ring the number given on the Royal Mail website (08457 749 740) a message sends you back to the website. If your mail was lost, delayed or damaged, it's assumed you'll want compensation, but the compensation form won't allow you to claim if you don't have full details of the amount of postage paid, a franking number, an item reference number and lots of things you won't know if you didn't even get the item. We finally found this general complaint form and submitted it. Ruth had called a different number (08456 112446) and chosen 'complaints' from the automated menu. She asked for a reference number for her complaint and then had to ring back to check her complaint had been logged – she says that no one on the Royal Mail complaints line offers any solution and can be very rude. Armed with the reference number, she then had to fill in the online complaints form. When we called the same number as Ruth we spoke to a (polite) Royal Mail woman who, on hearing our credit card story, asked if there was a TNT stamp on the envelope of our new bill. There was, we said, but there is also a Royal Mail stamp saying "Delivered by Royal Mail". She explained this means that TNT collect the bills from the credit card company, sort them and then deliver them to the relevant Royal Mail sorting office, where they are then added to the local postman's load. She was certain this was the problem and gave us a number for TNT so that we could direct our complaint to them instead. She would not give us a reference number or let us make a complaint with Royal Mail! The number she gave us for TNT put us through to TNT Express. Because our bill came through TNT Post we were then given a different number to ring. That number didn't work. Back to TNT Express for another number for TNT Post. That number answered "The mailbox is currently full and can't take any messages". A one-day-old Evening Standard story about a TNT operative dumping confidential benefits information from Barnet Council as well as statements from Barclays Bank. TNT has contracts with 11 London councils. Barnet Council said, "The relationship between TNT and the Royal Mail is a complicated one and we are trying to work out exactly who is responsible." TNT said, "We have identified the person responsible for this disgraceful action..."
In the comments section of the online ES story it turns out it's not just North London having a problem, and one reader commented ruefully, "This isn't Royal Mail giving work to TNT, this is TNT stealing work from RM, cherry picking what they want, offering it to businesses at a cheaper rate, then paying peanuts and getting monkeys to deliver them." Armed with this new information, we went back to our credit card company to see what they had to say about TNT and their lack of reliability. Apparently we were the first to make such a complaint. If they receive similar complaints about bills not being received, the charges may be retracted. So, anyone else out there having problems with their mail? Regrettably, I have been unable to locate the whereabouts of your missing item as the movement of First Class and Second Class mail is not tracked in any way as it passes through the postal network. In closing, I realise that only when a reasonable amount of time has gone by without further problems arising, will your confidence in our service be restored. I sincerely hope your future dealings with us are of a more positive nature and if I may be of any further assistance in this matter, please do not hesitate to contact me and I will be more than happy to help. I would like to take this opportunity to inform you that if you are unhappy with my response in any way, you can ask to have your case reviewed by the Postal Review Panel. They can be contacted by writing to FREEPOST Postal Review Panel or by email to postalreview@royalmail.com. So it seems the newly privatised Royal Mail is already in the habit of blaming its competitors. She reported to us however that her mail service has now improved as a result of her complaints. She may possibly never know what has happened to her missing mail. But if you are experiencing problems (ie realised you haven't received bills or notices you were expecting) it may be worth paying a visit to the local sorting office first – if you have the time, it's a morning off work to get there by 1pm. We caught two outdoor film screenings at #NXDFFF last night – just two of the six Free film festival events available yesterday. Passing by Honey's on the high street at around 7pm we saw high street resident Ryan preparing to show The Harder They Come. A screen was set up in the window for folk to watch from the street. There appeared to be nothing to sit on – Ryan told us we needed to bring our own seating. 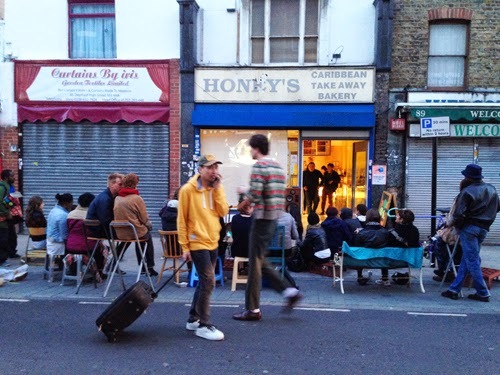 When we passed by again at 8.15 the screening was in full swing with the audience seated and refreshments on hand from Honey's. A heart warming scene – and a treat for the betting shop regulars who, since the pavement was full, viewed the movie leaning against the shutters on the other side of the road. 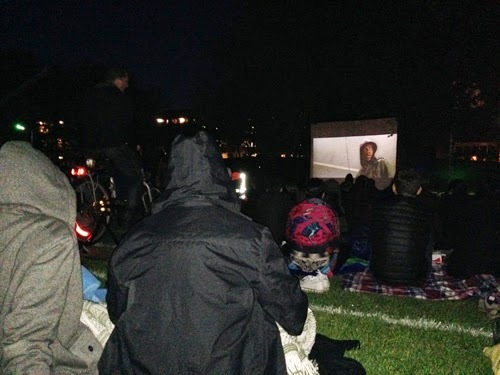 We then headed on down to Fordham Park with a blanket and refreshments to watch Attack The Block which was powered by eager peddle pushers on about ten bikes (riding the bikes was a sure way to keep warm if you didn't have a blanket). The picture started whilst it was still light, but good sound and projection ensured a smooth transition into cinematic darkness, and although it was a little nippy, there was none of the rain that plagued the festival's outdoor stagings last year. A great film and a very successful event! Older readers may recall the free outdoor screenings that took place some time ago in Greenwich Park, sponsored by Stella Artois. With the advantage of warmer weather – and later start and end times – the plague then was the deckchair brigade who paid a premium for a comfier seat and got in the way of other viewers (as happened in Greenwich screenings of the Olympics). No such hierarchy here – unless your restricted view was from behind the voluntary cyclists powering the film projection. So now to the news (which Twitter followers may have already picked up): we talked to festival organisers Jill and Andrew after the film and heard that Ken Loach may be attending the screening of Spirit of 45 programmed by New Cross Learning for this coming Wednesday 30th April (unfortunately the same time as the Deptford Market outdoor screening). Fans of the documentary and its politics, and those who missed this film last year in the cinema or on the telly may have the unique opportunity to talk to the film maker in a Q&A, as well as listen to the pre-screening talk by The Equality Trust already planned. Check this page for details and updates. If it happens, it's a great coup for both New Cross Learning and the festival. * Crossfields estate has been invited to take part but no one has yet taken on the responsibility of organising an event. The arches or any of our green areas would make perfect outdoor venues. However, whilst no one may be short on ideas, the problem is ensuring residents are not overly disturbed by a screening that cannot start till dusk and might not finish till after 10pm. Assembly, the group temporarily transforming the garden at Old Tidemill School (which was originally created by a Tidemill teacher living on Crossfields), are open every Saturday between 12 and 4pm for all things to do with growing food and gardening. 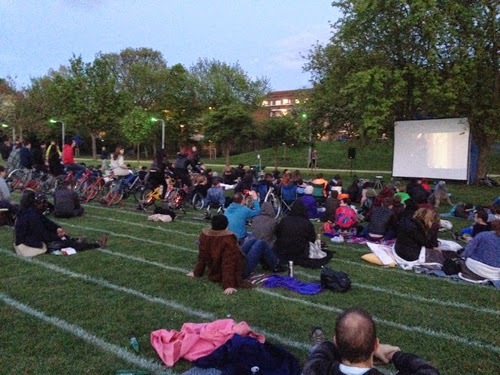 There's a Free bike-powered film screening tomorrow, Saturday 26th April, and May Day Celebrations on Saturday 3rd May. On Sunday 4th May at 1pm, they're screening Ping Pong, a film about octogenarian ping pong players vying for a world championship title – followed by ping pong tournaments for the film goers (2-3pm). Down on the river, a "rarely performed masterpiece" of Restoration post-Shakespearian tragedy drama (we had to look it up) can be seen at Paynes & Borthwick Wharf. Venice Preserv'd (written by Thomas Otway and brought to life by The Spectators' Guild) opened yesterday and continues till 8th June. Tickets are expensive but concessionary tickets at £10 appear to be available from May 1st. According to the website, these tickets must be "accompanied by proof of debt in the form of a recent student loan letter, bailiff's letter, final notice or negative bank statement". Whilst this is profoundly insulting, we've got our obligatory negative bank statement and will be taking it with us when we go to see this "tale of corruption, friendship and love" next week – even though we think that the funding behind this extravaganza could have supplemented more reasonably priced tickets for local people without them having to plead and prove poverty. Now we're onto pay-to-view rather than free shows, we'd like to give special mention to a show featuring partially sighted Crossfields resident Heather Gilmore. 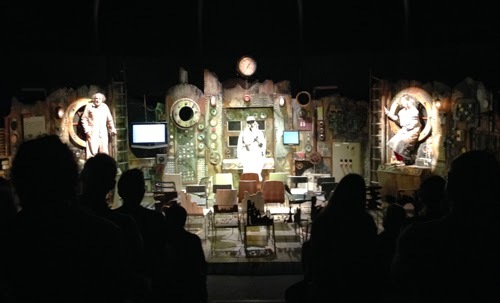 Extant presents The Chairs by Eugene Ionesco, with blind actors in the two main roles of an interpretation of this classic text. Tuesday 29th April - Friday 2 May, 7.30pm (£12/£10 and £5 for companions and supporters of disabled attendees). Lastly, preparations are under way for Greenwich & Docklands International Festival in June. LIFT (the London International Festival of Theatre) will be presenting Deblozay, a "processional theatre show, with acoustic and amplified sound, choir and local participation, plus light, theatrical pyro and fire effects". And Crossfields will be part of it. On June 20th & 21st at 9pm-ish, Deblozay will set off from St Alfege's Church in Greenwich, through Bardsley Lane and Claremont St estate to Norman Road, where it will cross the Ha'Penny Hatch and come into Crossfields estate at the railway arches at about 10.35pm. The spectacle will then move north to arrive somewhere near the Laban where there will be an outdoor bar until midnight. Rehearsals on Crossfields will be on 19th June. We're not sure which 'locals' are participating since Crossfields residents were not asked to get involved, but nevertheless it promises to be a local event worth looking forward to – and it's free! London's high levels of pollution are in the news this week: 457 pollution-related deaths in just one year in Lewisham, Lambeth, Southwark and Wandsworth, says Public Health England, as this South London Press story reports. As previously reported on this blog, we already know that air pollution on Evelyn Street/Creek Road (A200) is well above EU limits (thanks to the No to Silvertown campaign for exposing unpublished Greenwich Council results). As with the issue of tall buildings (see previous post), it comes too late for Convoys Wharf. Now that the Convoys Wharf development has got the go-ahead, the construction – when it starts – will significantly contribute to ever worsening conditions for local people living, working or going to school on or near the A200. Proposed river use for the transportation of building materials is still being negotiated, but even if that solution was embraced by the developer (they will try to avoid it), it would mostly be waste material. There will still be an enormous amount of materials that will have to brought by road to build 3500 flats. 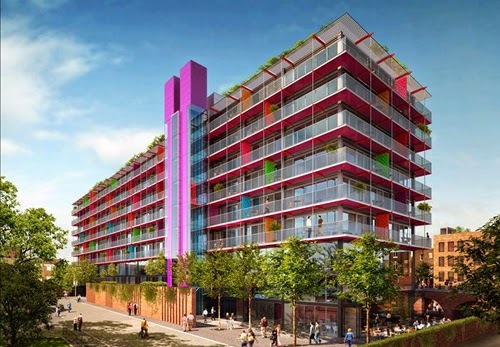 When complete, the development's proposed 1800 parking spaces will further raise pollution levels – unless its inhabitants and visitors are all driving electric cars by then. Those living on the waterfront in its luxury flats will benefit from very low levels of nitrogen dioxide and carbon poisoning, as do most waterfronts. Of course, with a predictable lack of vision and adherence to their own London Plan, polluting thousands of people was not a particularly important consideration for the GLA or Boris Johnson when deciding on the Convoys application, so keen were they to pass it. Nor did they grasp the importance of the Sayes Court Garden project in alleviating such conditions in the local environment. 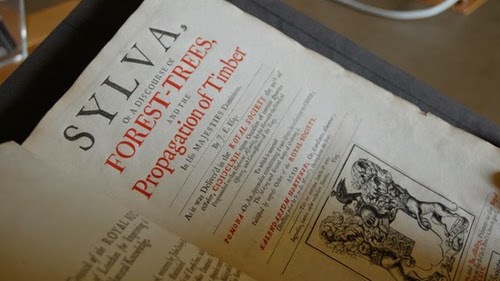 One of the biggest influences for the Sayes Court Garden project is John Evelyn's radical and influential "Sylva – A Discourse of Forest Trees, and the Propagation of Timber in his Majesty's Dominions", first published in 1662. Evelyn's ideas are still relevant today, and one in particular – growing trees to purify the London air. Last week, "The New Sylva" was published to great acclaim and press coverage. As the BBC's environment reporter, Mark Kinver, writes, "Today, trees are back in the headlines and on the political agenda. To coincide with the original book's 350th anniversary, two authors have written The New Sylva, a timely updated version for the 21st Century to highlight the strategic, economic and ecological importance of trees". Airpocalypse now! shouted the Evening Standard on Wednesday in their inside pages and asked "how do we prevent airmageddon?". Not much chance of that, with Boris in charge and the Evening Standard being funded by developers. Like housing targets (now extended over 20 years rather than 10), it's a moveable feast, with far, far fewer hybrid buses introduced so far than promised. An 'Ultra-Low Emission Zone' is proposed but not until 2020. Diesel powered black cabs are thought to contribute to one fifth of London's particle emissions. Oh! how long have we waited for black cabs to operate in this area, only to find they're death chariots! In February, local campaigners from Don't Dump on Deptford's Heart took part in a Citizen's Air Quality Survey, assisted by the Network for Clean Air, together with the No to Silvertown campaign. The results will be published shortly. Unfortunately, the data took over two months to be analysed, which was all too late to provide evidence to the government Planning Inspectorate consultation on the Thames Tunnel, and too late to show Boris and the GLA what a disaster awaits north Deptford when Convoys Wharf is being built. In Greenwich, campaigners have lost the battle to save the trees on Bardsley Green on Creek Road opposite St Alfege's School. The five mature trees they hoped to save (which they spiked with non-ferrous iron in an attempt to foil the proposed felling) have been chopped down to make way for a new development. 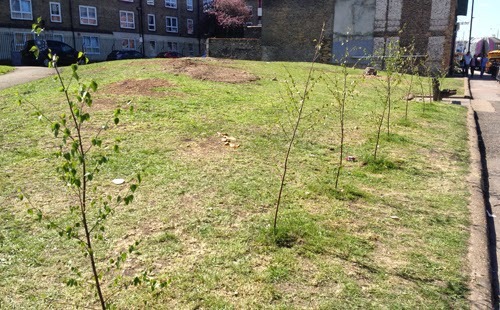 Undaunted, the campaigners have planted new trees. In Lewisham, a 20's Plenty For Us petition has just been handed in to the Town Hall to make every road have a 20mph speed limit. If that seems a bit extreme to you (as it does to us), check the campaign's Myth busting page and they have an answer to the pollution question too. 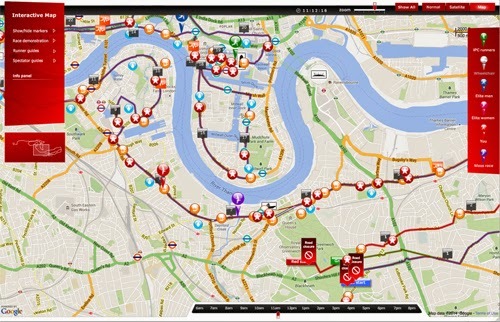 This is the interactive map of the race provided by virginmoneylondonmarathon.com (click to go to the interactive map). It appears Virgin Money don't actually have enough MONEY to update the map to 2014. Presently, many of the captions refer to the Olympics 2012 and apparently the Cutty Sark is still undergoing reconstruction. But the times will probably be the same. So if you're thinking of not going any further than joining your neighbours at the bottom of Creekside just after the 7-mile stage, you'll need to be there roughly between 9.45 and 10am to see the Elite Women, Wheelchair and Paralympic (IPC) athletes; followed by the Elite Men at 10.30, and the first runners in the Mass Race at 11am. 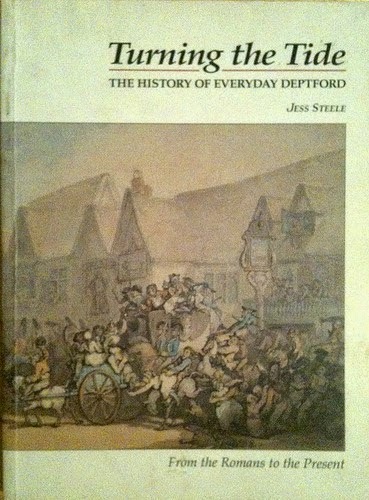 It is almost 21 years since Deptford's most popular history book "Turning The Tide – A History of Everyday Deptford" was published, and this event hopes to explore what has happened in the intervening two decades. 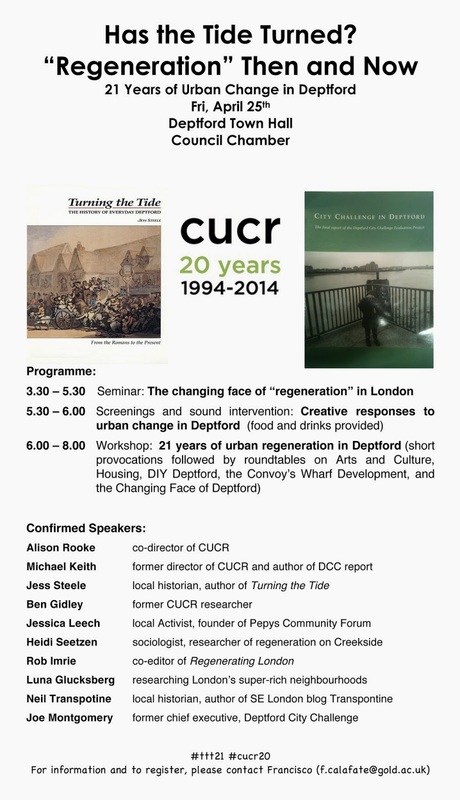 The Centre for Urban and Community Research (CUCR) at Goldsmiths College would like to invite local activists, local organisations, academics, residents, and government officials to this free event where you can share stories of the “regeneration” of Deptford. The publication coincided with the start of CUCR’s evaluation of the Deptford City Challenge programme which began the now seemingly endless initiatives to 'regenerate' our town (often with negligible benefits for the residents and increasing profits for developers). The aim is to discuss the recent changes in Deptford, but also to think about the possible futures for the area. The programme includes a seminar on "the changing face of regeneration in London" with several speakers as well as Turning the Tide author Jess Steele (3.30-5.30pm); screenings, sound interventions & "creative responses" + refreshments (5.30-6pm); followed by workshops on subjects such as Arts & Culture, Housing, DIY Deptford and Convoys Wharf (6-8pm). For more information and to register to take part, please click on the image below for contact details. This afternoon Creekside was closed to through traffic as police taped off the scene of an armed robbery. 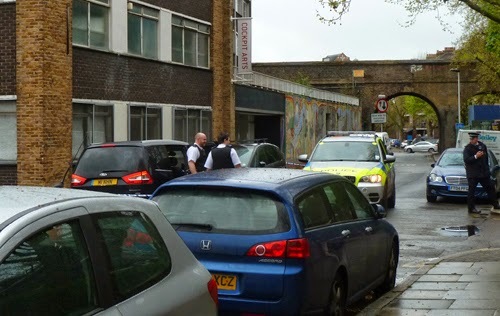 We understand a taxi driver was assaulted by his two passengers, who robbed him and caused him to swerve and hit a parked vehicle outside Cockpit Arts. The armed robbers ran away, and armed police were on the estate looking for them. Inside the minicab (the black vehicle to the left in this rather poor photo), we could see a figure moving. If it was the cab driver, he was obviously not fatally injured, though Jones workers nearby claimed there was a lot of blood. A Deptford cab driver suffered facial injuries after two men assaulted and tried to rob him - resulting in armed police being called out. The 51-year-old driver was attacked in his car, crashing it into a vehicle parked nearby in Creekside on Monday (April 7). Firearms officers were called out to the scene at 3.44pm after some witnesses reported seeing a gun. The cab driver was taken to a south east London hospital with facial injuries but has now been discharged. Two men have been arrested and bailed until May, but police still want to speak to any potential witnesses. The first suspect is described as white, in his 20s and around 5ft 10in tall. He was wearing blue jeans and a grey hooded top. Police say the second man was black, in his 20s, around 5ft 11in and wearing a blue jacket. They both ran away in the direction of Deptford Church Road. Anyone with information can call the Robbery Squad in Lewisham on 020 8284 8477 or Crimestoppers on 0800 555 111. A short film by Jim Owen featuring Deptford station and two local actors – Crossfields resident Alistair Green and high street dweller Ingrid Oliver. 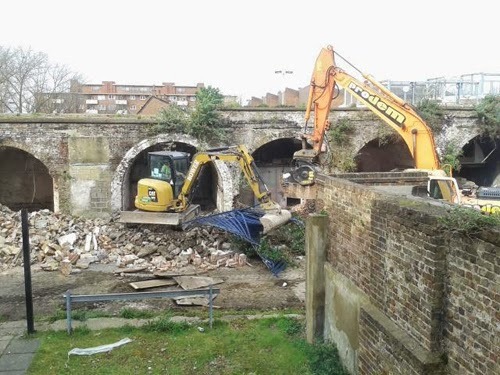 So the train's gone, and work has begun on Cathedral's £48m Deptford Project – much to the annoyance of local residents who now wake up to the sound of diggers. What a long way this project has come. 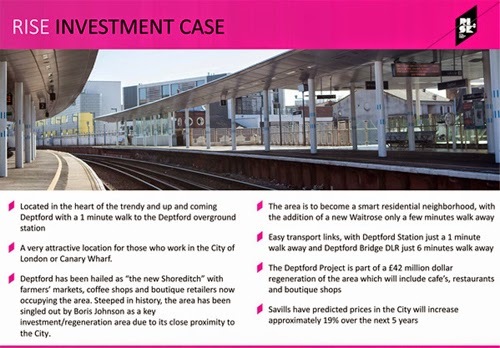 Originally the redevelopment of the site was part of Lewisham Council and Joan Ruddock's idea to revitalise both Deptford station and the area around it. Richard Roger's firm Rogers, Stirk, Harbour & Partners was brought in to come up with the design below in collaboration with Ash Sakula Architects. Cathedral won the contract to build it in 2007. 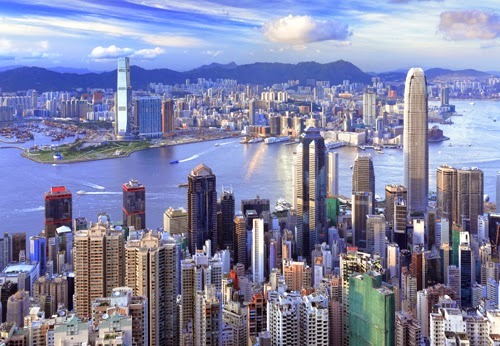 Now, after a long delay since planning permission was granted, they have raised the cash to actually build it – by selling the entire block of 121 flats to Hong Kong investor IP Global. 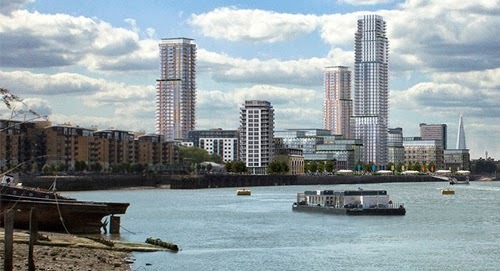 According to this report, this is "the second project in Deptford that IP Global has invested in. The company recently bought a block of 64 flats in a scheme at Hilton’s Wharf on Deptford Creek for £30 million". Hilton's Wharf is not actually in Deptford (and also not built yet). It's the other side of the Creek in Greenwich. Obviously Deptford is no longer a word that scares foreign investors away, despite the feelings of some snobby residents in the Creekside Village development on Creek Road who are desperate to change their postcode from SE8 to SE10. Conran Estates are now involved in marketing the development "in trendy 'up and coming' Deptford". They say, "This development is being marketed across the world, mainly Asia, but we have secured an early opportunity to offer to local purchasers for both residential and investment purposes". There are: 14 x Studios, 36 x 1-bed, 59 x 2-bed, 6 x exec 2-bed, and 6 x penthouses. • Deptford has been hailed as "the new Shoreditch" with farmers' markets, coffee shops and boutique retailers now occupying the area. Steeped in history, the area has been singled out by Boris Johnson as a key investment/regeneration area due to its close proximity to the City.